The BG series full-automatic decapping machine (cap removing machine or 5 gallon bottle decapper) is a kind of corollary equipment specialized for 5 gallon barreled potable drinking water production line. 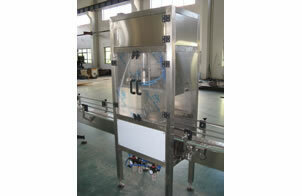 This cap removing machine is especially suitable for automatically decapping of recycled barrels before cleaning. This 5 gallon bottle decapper not only largely improves efficiency, but also reduces secondary contamination caused by manual decapping and work intensity of workers. The whole equipment is fully made of high quality stainless steel, which is corrosion resisting and easy to wash. Main electric components are products from SIEMENS, Mitsubishi, and pneumatic components adopt imported AIRTAC products. This equipment is characterized by compact structure, high efficiency, stable and reliable operation, and high automation. Jiangsu Topling Machinery Co., Ltd is a professional manufacturer and supplier of decapping machine in China. Apart from decapping machine we still have other products, such as bottled water filling line, juice filling production line, carbonated drink filling line and related equipments including rinsing filling capping machine, capping machine, bottle unscrambler, etc. And all of our filling line has got the standards of CE, and ISO9001-2008. With good quality and affordable price, Our company successfully offers many production lines for many well-known brands at home and abroad, such as Coca Cola, PEPSI. If you need the decapping machine, please contact us.